Are Fiberglass Shingles Right for Your Climate? The average roofing installation price for a fiberglass shingle roof costs anywhere between $8,500 to $16,500 depending on the slope, pitch, and size of your roof. You can expect to pay $1.00 to $3.00 per sq. foot or $100 to $300 per square installed on a standard sized single story home. Costs will vary depending on local roof contractor’s pricing. View your potential roof installation savings with local contractors below. Fiberglass shingles are among the most cost-effective roofing shingles available. Fiberglass shingles can be applied directly over old shingles, saving you the expense of removing and hauling away your old roof. It is important to note though, if there are already two or more shingle layers on your existing roof, it is HIGHLY advisable to remove the old layers before applying new shingles. Price: $1-$3 per square foot. Lighter than organic mat asphalt. More environmentally friendly than regular asphalt shingles. Less prone to shattering with extreme weather. Generally carry a longer roofing warranty – 15 to 30 years. Fiberglass shingles are made of a woven fiberglass base mat, covered with a waterproof asphalt coating, and topped with ceramic granules that shield the shingles from harmful UV rays. Because of the composition of the fiberglass mat, less asphalt is needed to give the shingles their durability and strength, making them a lighter and more environmentally friendly option than traditional organic-mat asphalt shingles. Fiberglass roofing is a great option for your roof installation project because it is a tough and very resilient material that is non-porous, does not change shape, and won’t dry out. 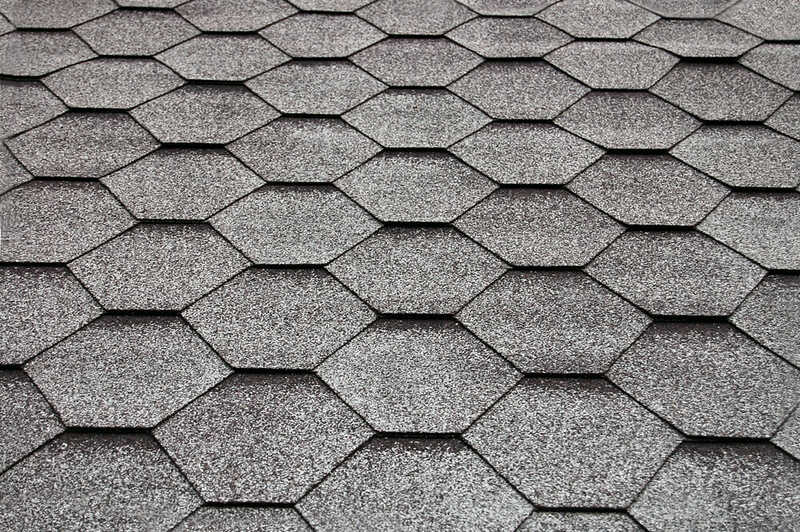 Three tab fiberglass shingles are distinguished by cutouts—tabs—made along their long lower edge. The result is that each shingle looks like three separate pieces when installed, but it’s only one. Architectural fiberglass shingles contain no cutouts, but their lower portions are laminated with an additional asphalt layer. This creates the contoured, dimensional look that gives them their name. Asphalt sealant bonds the layers, reinforcing the shingles’ waterproof capability. Fiberglass shingles come in a wide array of styles. Some are made to imitate the look of slate roofing, cedar shakes, or even tile at a fraction of the cost. Color choices are also more varied than ever. You’ll generally find tones ranging from pale gray, medium gray and dark gray to beige, reddish and medium brown to dark brown, plus shades of blue and blue green. You can also create a weathered, polychromatic look by mixing light and dark tones. Manufacturer warranties currently guarantee fiberglass shingles for 15-30 years. The large variance in those warranties are typically based on climate, weather, and other environmental factors. Homeowners in areas enduring long summers with high heat may need to replace roofing sooner than homeowners in cooler regions. In areas known for severe winters, ice may aggravate tiny cracks and fissures. Algae and fungus growth can also be potentially damaging for roofing in perennially damp or subtropical areas. Algae-resistant shingles are available. The ceramic granules on the shingles are simply coated with leachable copper to prevent discoloration and long-term damage from algae and moss growth. Keep in mind though, this protective treatment can add 10-15% to your materials budget. Because fiberglass shingles contain less asphalt than organic mat-based shingles, and are easier to transport, they have a lower overall environmental impact. Fiberglass shingle manufacturers are also adopting energy-saving, cool-roof technology to help reduce the amount of heat absorbed by the roof. Look for shingles with Energy Star ratings and you can significantly reduce the cost of cooling your home.